I suppose I should write something serious about Obama’s class-warfare agenda, but I’m in Iceland and it’s almost time to head into Reykjavik for dinner. So let’s simply enjoy some humor that gets across the points I would make anyhow. We’ll start with this great cartoon from Lisa Benson. In a perfect world, this monster would be named “Big Government.” But I’m not complaining too much since the obvious implication of the cartoon is that the soak-the-rich tax hikes will make the deficit worse – which implies that politicians will spend the money and/or that there will be a Laffer Curve response leading to less revenue than politicians predict. You can see some of my favorite Benson cartoons here, here, here, here, here, here, here, here, here, here, and here. Here’s a similar cartoon. 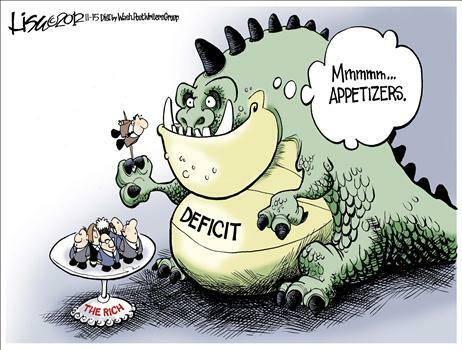 But instead of feeding a deficit monster, it shows that a tax hike will enable a bunch of politicians to continue their binging at our expense. Holbert is relatively new to me. The only other cartoon of his that I’ve used (at least than I can remember) can be seen here. Our final cartoon isn’t about Obama’s class-warfare proposal, but it does show where we’re going if we allow the politicians to continue down the path of tax-and-spend dependency. You can see two additional Glenn Foden cartoons by clicking here and here. I especially like the “spa” comment in the basket cartoon. Sort of reminds me of the “frog” story showing how it would be impossible to impose statism in one fell swoop. People would recognize the danger and immediately revolt, much as a frog would immediately hop out if you tried to drop it in boiling water. But just as you can lure a frog into danger by putting it in lukewarm water and slowing turning up the heat until it’s been too weakened to escape, you can also slowly but surely hook people on dependency by creating little programs and eventually turning them into big programs. That’s sort of where we are today. 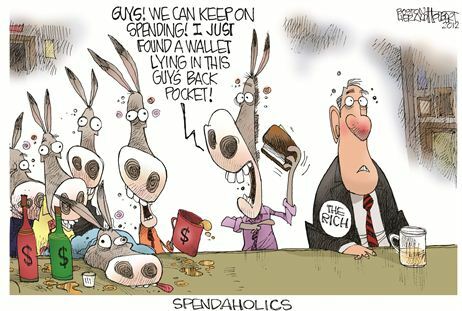 The burden of government spending has exploded and will get even worse if we don’t enact serious entitlement reform. But too many people now can’t envision a world other than the status quo and they are fearful of change – even though inaction eventually means a Greek-style fiscal crisis. P.S. Given the theme of this post, you will probably enjoy this Chuck Asay cartoon and this Henry Payne cartoon. Or perhaps you won’t enjoy them if you stop and think about what they’re really saying. But they are both gems, so try to focus only on the humor. 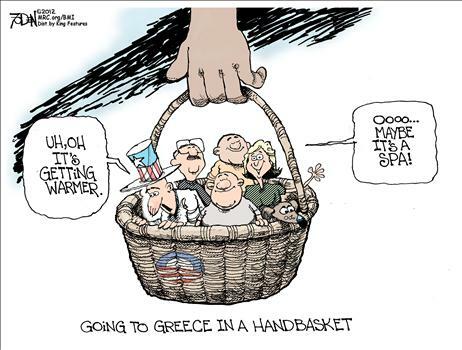 More political cartoons this time on O’s class warfare agenda. Andrew, you’ve got it a bit mixed up. It’s not the elites in the water, it us. The elites are standing at the stove turning the knob clockwise. [edited excerpts] The premise is that if a frog is placed in boiling water, it will jump out, but if it is placed in cold water that is slowly heated, it will not perceive the danger and will be cooked to death. According to contemporary biologists the story is not literally true; a frog submerged and gradually heated will jump out. German physiologist Friedrich Goltz demonstrated that a frog that has had its brain removed will remain in slowly heated water, but his intact frogs attempted to escape the water. There you have it. Frogs are sensible, the result of 100 million years of evolution. But, current elites are more like a frog with its brain removed. The average American voter has two options: Either spend SIX times as much as the average world citizen and have enough to build his own safety net, or have other Americans pay for his safety net (which BTW has a tendency to become a permanent crutch) and use all his income to live a life EIGHT times as prosperous as the average world citizen. He is obviously choosing the latter and the one to two percent annual growth trendlines to decline that go with such flatter effort-reward curves. Shows you where the real greed is. The greed of “just a little bit more unearned income, so I can rise from the top 10% of wealth worldwide up to the top 8%”. Alas, the flatter effort reward curves you will create will take you down to a worldwide 20%, 30%, 50%. And that will feel very different indeed – especially since, as leftists know too well, it is often relative prosperity we judge things by. But I’m sure that the hundred or so billion in class warfare money that we will raise from the rich, I.e three hundred dollars per American, will satisfy the welfare and redistributive aspirations of HopNChange faithfuls. What will the monster eat when the appetizers are gone? It will inevitably eat the very same people that raised him. It will keep forming fluid and switching majorities with the skinniest of peasants to eat a minority until everyone – or at least their money in the allegory – is gone. Not to worry though, American DNA will keep working and out competing the rest of the world under flatter effort reward curves. And besides God is on America’s side. What can go wrong? American success is preordained even if Americans adopt the same class warfare mentality that is norm in most of the rest of the world. So lets CHange. I HOpe it works! WE need to focus on job creation not class warfare. Perhaps the lucky but naive passengers of the american basket are just hoping for a soft landing on the French plateau. But the doldrums of the French plateau will not last long, as France will prove soon. Alas not soon enough, I see America already past the event horizon. I just don’t see how in the coming years of ever more evident decline (though it will not be constant, there will be short outbursts of new hope, otherwise the frog jumps out, if the trend is consistently worse) Americans could possibly not only reverse all the HopNChange they so enthusiastically ramped up to all these years, but also all the statism that Bush brought. I just dont see it happening. As decline takes hold, I see people redoubling on huddling together, willing and not, which will only mean intensifying erosion of the once legendary American motivation. If American culture converges to the average mentality and effort-reward curves of safety nets paid by others, American prosperity will inevitably follow suit. Sooner rather than later. 1. Prayer for your safe travel. 2. The level of economic ignorance in this country is frightening. People have no idea how wealth is created. This included the President. 3. Keep up the good work, and thanks for your blog. Like the good professor said, it’s like getting free ice cream.